One of my New Years resolutions this year was to comment on more blogs, and beef up my back links a bit. Sure, Bauer-Power does okay in the Google PR department, but certainly not as good as some other blogs. Everyone knows that the way to boost your Google PR is to score relevant back links, and lots of them! Some people don't focus on this, and wonder why their blogs don't get any traffic. Lots of people say, "Screw Google, I'm going to spend all day trying to get to the front page of Digg." They don't realize that the quality traffic they need has to be natural traffic from people that want to read your stuff. Natural traffic comes from search engines, where the people landing on your site are actually looking for something you have! Now don't get me wrong, getting to the front page of Digg will bring you server crushing traffic, but the chances of you getting your stories up there are slim to none, unless your handle is MrBabyMan. Besides, getting to the front page of Digg, or Reddit takes a crap load of work. You have to build friends, you have to shout stories, blah, blah, blah. Search engine traffic, on the other hand comes without you working hardly at all. I guess I shouldn't say that, I mean you do have to write some stuff worth reading, and you have to increase your back links. According to Google Analytics, search engine traffic to Bauer-Power comprises almost 62% of my traffic. That is more than half of my traffic! Well I aim to change that. I want it to comprise way more than that, and still have an increase in visitors at the same time. Which brings me back to my original point... Increasing back links. So as I mentioned I am planning on commenting on more blogs. I figure ten a day is easy enough. Now, I am not going to comment on just any old blogs. They must meet two criteria items. For those of you not in the know, DoFollow sites allow search engine spiders to crawl their sites and categorize the outgoing links. This helps those sites boost their page rank on search engines. If a site is a NoFollow site, they add a special tag to their links telling search engines not to categorize outbound links. Hence the reason why only commenting on DoFollow sites can help your rankings. Anyhoo, I found a cool Firefox (Or Flock! Hells yeah!) plugin that allows you to tell who's who in the zoo when it comes to DoFollow and NoFollow. It's called NoDoFollow from ZacharyFox.com. 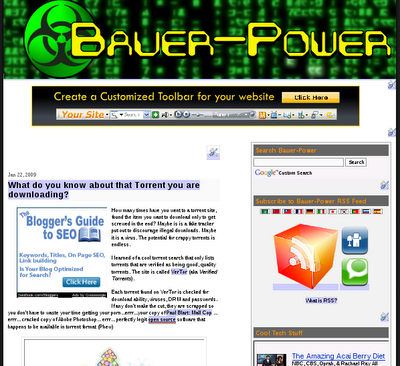 Want to know if you should comment or not on Bauer-Power? Check it! The links are blue baby so comment away! What other methods of increasing back links do you know of? I would love to hear about them in...you guessed it, the comments!